We specialize in construction around the water, so cofferdams come second nature to us! Cofferdams are an essential part of dam construction, and at Brennan we have experience in installing many types and sizes of temporary structures. From robust cellular cofferdams to cost effective Portadam™ systems, we have the expertise to find a solution to fit any project. We have a full service fabrication shop and can create customized cofferdams that will optimize efficiency and safety. Safety is paramount when working with cofferdams. There are many risks involved in installing and maintaining an effective cofferdam such as ice flows, current, vessel traffic, rock fissures, flood events, soil conditions and more. When working inside, crews are often in confined space conditions, requiring atmospheric monitoring and emergency response plans. At Brennan, we are familiar with both large scale cofferdams such as cellular structures as well as small cofferdams such as box-type, and will create an effective safety plan for each individual project. 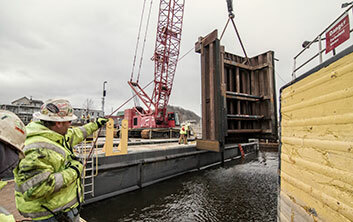 Building and installing a cofferdam is only half of the challenge. Maintaining an effective dewatering plan is crucial for the safety and efficiency of the crews. Effective seals and back up dewatering plans can mean the difference between the success and failure of a project. J.F. Brennan Company specializes in dam construction projects throughout United States. 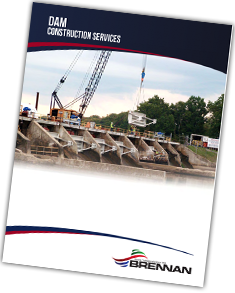 Download our brochure here to learn more about our cofferdam and dam construction capabilities. Want to know more about our cofferdam services? Please fill out the form below!